I have a pair of video clips (mp4) that I would like to join into 1. The internet tells me that I can do this with Quicktime. "The operation could not be completed; an unknown error occured"
Can anyone tell me what were I'm going wrong? Browse other questions tagged video quicktime . Why does my FCE export to DV take forever? Can Applescript be used to automate a screen recording session on OS X? How do I trim first and last few seconds of a mp4 using AppleScript? 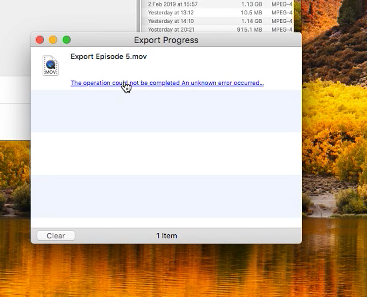 What is QuickTime “unknown error (-50)”?